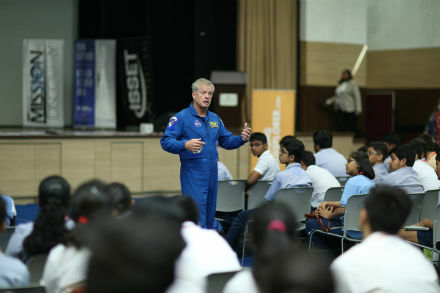 Gurgaon, October 5, 2017: Half a dozen space experts from America and the UK are conducting a five-day workshop at the Shiv Nadar School, Gurgaon, as part of a globally acclaimed, experiential learning program called Mission Discovery. This is the second edition of the Mission Discovery India program and it is being held at the Shiv Nadar School (a not-for-profit initiative of the Shiv Nadar Foundation), from October 3 – 7, 2017 after its huge success last year. The mission has been organized in collaboration with Young Edsplorer Pvt Ltd (an innovative learning organization that works in partnership with schools to promote the concept of Experiential Education) and ISSET (International Space School Educational Trust), UK. More than 200 students from Shiv Nadar School as well as 23 other schools in the Delhi / NCR region and cities like Hyderabad, Chennai and Bangalore have travelled to Gurgaon to participate in the event and learn more about space, considered the final frontier for human exploration. Coaching the students from morning to past afternoon are Steven Ray Swanson, a retired NASA astronaut who has flown 2 space shuttle flights and logged over 643 hours in space and completed 4 spacewalks; Rocket Scientist from NASA Monica Foley, and Julie Keeble, a lecturer in Pharmacology at the Institute of Pharmaceutical Science at King’s College London. The experts are educating students about how NASA builds a team of astronauts, the journey to Mars, how to become an astronaut, the International Space Station environment and its expeditions. Students will also learn about pharmacology and space and how the earth looks like from the inky blackness of space. The emphasis is on real-life issues linked to space and its limiting environment. Participating students have been divided into 25 teams comprising 8 students each (from class 8th upwards), to design models/experiments to mitigate space limitations. One such experiment will be selected to be launched into the space. The winning experiments from past global Mission Discovery programs have investigated issues such as the effectiveness of treatment of conjunctivitis in microgravity, and carbon dioxide consumption by cacti in space. Mission Discovery is organized by The International Space School Educational Trust (ISSET) and is a global program conducted in the UK, USA, Australia and India. It inspires school students by offering them an opportunity to have their ideas carried out by astronauts as they orbit the earth on the International Space Station. Students also get to learn firsthand from astronauts, world-famous scientists and NASA leaders. The first ever Mission Discovery program in India was hosted at Shiv Nadar School, Noida in 2016 and was also the first to be held in Asia.